Smart Policy Insurer Portal is a Broker Connect Solution that will allow insurance companies to connect with their brokers and agents (intermediaries). The portal will enable the insurance companies to eradicate manual distribution of cover note books and maintaining them. The portal supports selling of General, Life & Medical Products. Thus single portal will cater all your required insurance products making it cost effective to you for not embarking upon multiple software products for each of these insurance products. At the same time, your intermediaries will have only one portal to deal with, which can enable them to do the business with all your insurance products. On the other hand, the portal will offer your intermediary a complete solution to run their operations. The portal will help them to not only issue your Cover Notes but also their Debit Notes and Cash Receipts. The system will also cater their need for tracking payables and receivables. The system will also assist them to manage their own renewals and reminding customers over SMS & Emails. Smart Policy would provide ultimate benefit to the insurance company and their intermediaries to run their operations more effectively and seamlessly. Portal will facilitate monitoring of cover notes issued by your intermediaries on a real-time basis. 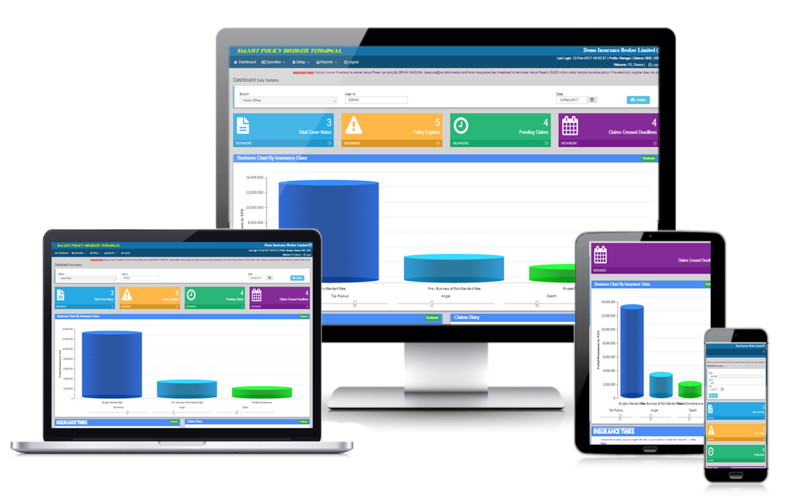 This will also enable monitoring and tracking the performance of your intermediaries. It will enable your underwriting team to follow up with non performing intermediary proactively. End of the day the portal will automatically send emails on your registered emails. Thus your underwriting team will be on the top of the business to book the business done by your intermediaries and covering the customers without any delays. Your intermediaries will have one system to transact all your insurance products. Further you can introduce customized products and you may assign them to your preferred intermediaries. The portal will have all the flexibility to make your own products and disseminate to your intermediaries. Smart Policy will enable you to setup credit limits for your Intermediaries. Thus if your intermediary utilizes his limit and doesn’t pay you, the system will further refrain from issuing your cover notes until the outstanding premium is cleared. This will enable you to control your debtor and track your payments. Smart Policy enables you with a mechanism to collaborate effectively with your Intermediaries on Claims. This will provide a greater level of confidence to your intermediaries on your approach to handle the claims. The portal will enable your intermediaries to register claim intimation and upload supported claim documents. Further it will enable you to provide timely feedback to your intermediaries on the same. Smart Policy can be integrated with your core system so that it can automate data entry and the policy issuance instantaneously. This will serve your customer even much faster to get him on cover with no delays. This process will also eradicate the delays of receiving cover notes from the intermediaries and the laborious data entry work. Receive cover notes over email issued by your intermediaries on end of day basis. Thus keeps you on top of your business.